The QuickDisc is a simple and useful tool for the determination of exposure compensation when photographing small objects with large format cameras. 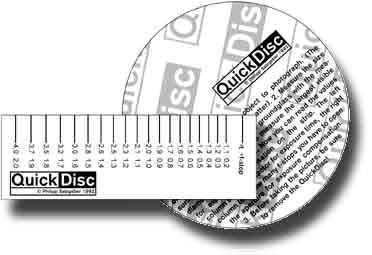 The use of the QuickDisc involves no calculation, it is lightweight, easy to replace and free for personal use. It consists of two pieces of cardboard, the disc, and the measuring strip. The measuring strip is marked in tenth of an f-stop, giving more accuracy than you will probably need. To determine the exposure compensation, you place the disc next to the photographic object and then measure its apparent diameter on the ground glass of the large format camera. You can print a copy of the QuickDisc on you own printer after downloading the QuickDisc file. When photographing small objects the increased lens to film decreases the effective f-stop. This is not a problem with modern 35mm and most medium format cameras, because they meter the exposure through the lens (TTL). But only few large format cameras are equipped with such sophisticated metering systems. I think I am not the only one having other things than mathematics on my mind when photographing, so I designed the QuickDisc as an improved way of determining the exposure compensation by measuring the image scale.